A pastor that I used to work with once told me to distinguish "singspiration" from "worship" for a Sunday worship service. The initial songs and choruses were deemed to be "singspiration" stuff which are light and lively. The later hymns and music are then considered suitable enough for "worship." At that time, I just took his words for it, that there is a difference between the different types of songs. I did not question his experience or choice of words. What I did is to keep it in my memory bank, to be reflected later on. Today, I think about the dichotomy of modern worship services and I shudder. Why is there a need to call some songs "singspiration" and others "worship?" Are all choruses under the former category and hymns in the latter? Is there such a thing as "singspiration" in the first place? Is "singspiration" the kind of activity that is more about positive musical programming or a self-help activity to beef up our tired senses? In some Churches, they use children's songs. One example is the song "Happy All the Time." We have a load of fun in doing this action song. When I look at it from a human standpoint, is it really true that one can be "happy all the time?" Maybe we are indoctrinating a fairy-tale like Christianity into our kids, for the world is certainly NOT filled with happiness all of the time. As I think about it, the very separation of "singspiration" and "worship" is already wrong from the start. For when we call the entire Sunday service as "worship service," we need to let it BE the worship in every element of the service. In fact, the moment we get out of our beds, into the car, getting ushered, through giving, listening to sermons, and to the end of the entire service, we are already participating in various acts of worship. Romans 12:1-2 reminds us that our bodies are to be living sacrifices, to do what is holy and acceptable to God, letting them be our "spiritual act of worship." Call it light singing or heavy singing, what we do in the name of the Lord is to be labeled "worship." No more, no less. This week, I like to reflect on some of the songs that we commonly use, that worship leaders need to be theologically aware and be focused less on style but more on substance; less on fluffy words but more on theological truths; less on selves but more on God. I will subsequently provide additional tips for worship. When Graham Kendrick first wrote this popular song, he invited a theologically trained friend and scholar of his to look at his early draft. After some initial nodding of the head, the friend soon started to shake his head. The problem was in the words of Christ being "clothed in humanity." What was wrong with that? The point is this. Clothes can be put on, and it can also be easily put off. Theologically, the words do imply that Christ only wears human skin on the outside. That goes against the theological truth that Christ is fully God as well as fully man. Christ is not just human on the outside and divine on the inside. Christ is fully human, not just at skin level. Unwittingly, Kendrick's words suggests a form of Gnosticism that presents a divine spiritual being trapped in human skin. Worse, it presents seemingly imperfect human on the outside, hiding a divine Spiritual good on the inside. One of the earliest heresies that was battled was the war against Arianism, where it thinks of Christ being created instead of divine. Another was Appollinarism which splits the person of Christ up into a human body and a divine mind. All of these heresies are taken very seriously in the Early Church, leading to formation of the Nicene Creed and later on, the Apostles' Creed. Thankfully, Kendrick replaced the problematic words with "dwells in humanity" which made it more theologically sound, as according to John 1:14. It is a shame when a beautiful song gets wrapped up in words which are theologically weak. Worse, when it promotes heresy, it makes singing in Church theologically dangerous. We need to sing not just with our lips but with our minds focused on God in worship. Another song which increasingly rubs me on the wrong theological end is this popular song by Michael W. Smith. It is sung in many Churches and Christian communities. The melody is catchy. The mood is uplifting. The words are worshipful. Yet, for all the music and the captivating lyrics, I am disturbed by the chorus. It all seems well, as we reflect on the glory of God and the sacrifice of Christ. Yes, it is true that Christ was crucified to save us. Yes, it is true that he took the fall for us, and he rose from the dead. However, why must we put ourselves on the throne? Is it really true that Jesus was thinking of "us" as He died? Wrong! He was thinking of God the Father. Note how he prayed even as he was humiliated. Luke 23:46 Jesus called out with a loud voice, "Father, into your hands I commit my spirit." When he had said this, he breathed his last. Matthew 27:46 About the ninth hour Jesus cried out in a loud voice, "Eloi, Eloi, lama sabachthani?" --which means, "My God, my God, why have you forsaken me?" All of these are examples of who exactly Christ was thinking about as he died. He was thinking of God the Father! What makes it worse is the next verse, "above all." Goodness me. What kind of nerve has man got to claim that Jesus's overriding concern and purpose is to elevate humankind above all? Is the mere human being above all things? Does that mean man is above God? No! There is only One who is truly and fully above all, and that is God! Change the words "And thought of me" into "And thought of Him (Father God)" above all. We must move away from our narcissistic world and egoistic concerns to remind ourselves that worship is not about feeling good. Worship is about lifting God up high, regardless of whether we are feeling good or not. Christ by highest heaven adored; Christ, the everlasting Lord! Again, we are reminded that Christ is not "veiled" but is fully human. Edith Margaret Clarkson, hymn writer who lives in Toronto gives 6 tips on how to choose a good hymn. I provide them in brief. Be God-centered, not man-centered; looking upwards, not inwards. One of my friends from Regent maintains a blog focused on the theme of "Thinking Worship." She is a fantastic musician, extremely versatile in all things artistic and worship. Stacey also writes beautifully and composes her own liturgical movements and worship services. What I like about her style of worship is how she infuses theology with prayer, music with doctrinal excellence, pointing people heavenward and at the same time, remaining firmly in touch with the world we know. It is in her very unique way, letting the liturgy become "God's will be done on earth as it is in heaven." Let me share one example to show you what I mean. In the post, "A Prayer for Mental Health," she reflects upon Psalm 23, grapples with the struggles of mental health, she blends in her meditations on the Shepherd psalm with a sensitive awareness of people struggling with depression and various sorts of mental illness. She reflects not only truthfully but eloquently as well. Combining heavenly receptivity with pastoral sensitivity, it is a powerful rendition of worship that is both heavenly minded and earthly grounded. This is different from mere focusing of self-needs with the self in mind. It is looking heavenward with our whole being, trusting that as we focus on God, we let God decide how to deal with us. The main focus is God. For worship is all about God. Like sheep coming into the arms of the Shepherd, we are running toward the arms of a Loving Father. In worship, we cannot become too heavenly minded until we are of no earthly use. The beauty of whole worship is likened to the "whole prayer" as espoused by Walter Wangerin Jr. There are basically four parts of praying, all of which are important. In a nutshell, we get what whole prayer is all about. Worship is also like that. We sing to God and let God receive our praises and our worship. Throughout the worship service, as we speak to God, we slowly let our spirits listen to what God is saying to us. Eventually, we arrive at the point of worship that is all about God, and also all about God's love for us. Far too many times, we enter into God's presence based on our own needs, our own concerns, our own agendas, and our own egos. We need to put first things first. In worship, we must move toward whole worship that begins, ends, and continues in God. Until we recognize that all along, as we seek after God's heart, we will slowly realize in a strange manner, that it is God who has been leading and guiding us all along. Worship needs to be in Spirit and in Truth. 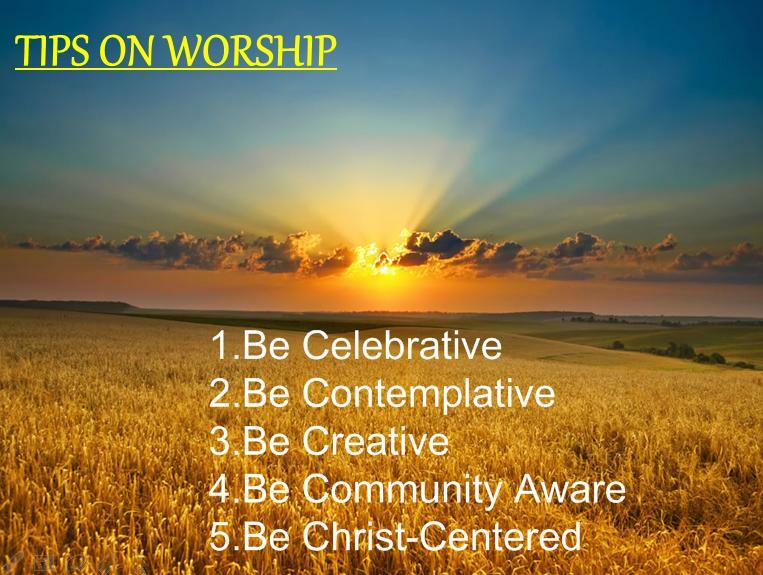 Let me suggest five tips for worship leaders as well as worshipers in general. There is no need to come to God in a moody and dull disposition. Coming together is a joyful adventure. Especially for those of us who are free to gather in faith communities in our respective countries, rejoice with fellow believers that we have the freedom to worship God. Celebrate with one another when a soul turns to Christ. Celebrate victories of answered prayers. Even if our own needs are yet to be met, that does not mean we cannot celebrate the joys of others. There is a time to celebrate and also a time to contemplate. Many of us are ready to come to God with a shopping list of needs and wants. What about taking a step back to be more reflective upon God, and to see ourselves in the light of God's truth? It is one thing to downgrade ourselves or our needs. It is yet another to rightly see what we need. Worship does not mean we are forced to humiliate ourselves in order to make God look bigger. It is about seeing ourselves the way God sees us. It is about living in a way that pleases God. It is about the special relationship that God desires between Him and us, through Christ. Sometimes, whether it is the pressure of time or various expectations, some of us tend to be change-averse. We sing the same old songs out of convenience. We prefer the same sounds and rhythms, and sometimes, it can be really boring when the congregation does not seem to be in any spirit of expectancy week in, week out. There is no need to go to either extremes of boredom or rapid changes. Little creative changes can help break the boredom as well as promote creative worship. One example is the use of music in songs. Why not during some weeks, sing it without instruments? What about just reading the words like a liturgical reading? What about alternating the singing between men and women? There are many ways to be creative. We cannot enter the Church with an individualistic mindset. That will mean coming in with earphones on our ears connected to our individual iPods or MP3 players. God forbid. Worship in the Church is about worshiping God together as a Church. One excellent resource to help us in worship is to use the Psalms. Note Eugene Peterson's reminder to us about God speaking to us (plural) in the Psalms. Finally, we must remember that unless we come to God in Christ, we are in danger of coming to God in the name of self. Without Christ, we will be like Moses forced to keep away when God appears to him in the burning bush. Without Christ, we remain in sin. Without Christ, we are on our own. Songs that focus our attention on Christ are "Majesty" written by Jack Hayford, the hymn "All Hail the Power of Jesus' Name," "Jesus Name Above all Names." I am sure if you watch for the words and the way the lyrics are pointed, you will recognize what songs are Christ-centered or not. Let me close with this. When thinking about worship, one word to remember is "ascribe." Like the beginning of the Psalm 29, it is all about giving glory, honour, and praise to God. Note also how Ps 29 ends. It reminds me of this simple truth, as in the words of a popular chorus. Turn our eyes upon Jesus, and look full into his wonderful face. Then the things of the world will grow strangely dim, in the light of his glory and grace. It is not the world of ours becoming smaller and smaller. It is about Christ in our hearts growing bigger and bigger, that we begin to see ourselves rightly and appropriately from the eyes of God. That was one of the insightful message i have read about worship. It has been something that i came to realize. Worship isn't prayer. worship isn't about us, or how i 'feel'. Its about praise and being in awe of our Lord and God. I still remember there were times i used to 'misuse' the time of worship - sometimes for prayer and petition, sometimes to catch up with God after a dry week, etc. Its only in the past few months, I have made it a point to worship the throne of grace and not be distracted by anything.